With the current version 1.7, Minecraft developers have dared to take a step away from the popular blocks look. However, the real thrill of the game is hardly its visual effects. A small selection of games has been and still is available for Linux. Recently, Steam for Linux has added an interesting series of indie titles; but, as far as the really big, popular games are concerned, in most cases, you still have to hope the Windows version somehow works with Wine. A really laudable exception is the game Minecraft  from the Swedish developer Markus Persson  and his company, Mojang. It's completely based on Java and OpenGL, so it runs splendidly on Linux (Figure 1). 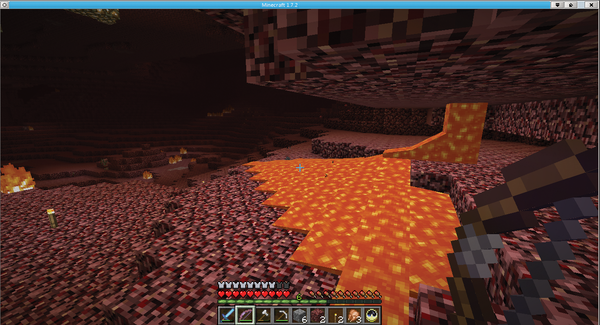 Figure 1: Minecraft 1.7.2 brings new landscapes – and it runs flawlessly on Kubuntu 13.04. Moreover, Minecraft doesn't bother you with complicated copy protection mechanisms; instead, it works with a simple registration over the Internet. All in all, working with Minecraft is like working with any freely licensed software. If you've been living under a rock for the past year and are wondering what kind of game it is, it belongs to the Sandboxed Open Worlds category. These types of games simulate a world in which you can move freely, erect structures, and change the landscape. Minecraft also has elements of adventure and strategy games, such as hostile monsters, growing plants, and competition with other players in multiplayer mode. The one-time fee you pay for Minecraft is limitless, even for the frequent upgrades. The user can do with the software what he wants – except redistribute it. Thus, there's no problem experimenting with other developers' changes. 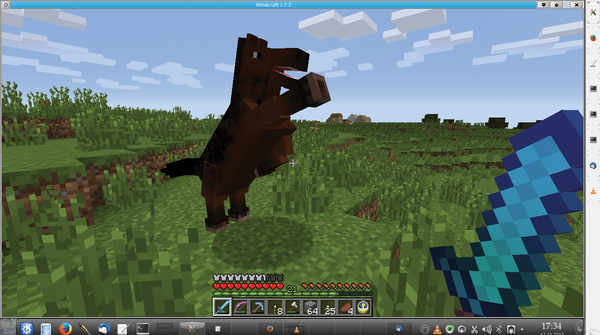 Besides the stable version, Mojang also provides access to beta and even alpha versions for free download. Registration (20 euros, payable by credit card or PayPal) allows login to all versions of the game. All downloads are freely available; the game asks for the registered username only at startup. Without an Internet connection, Minecraft provides the Play offline option, which has no restrictions but precludes any multiplayer activity. Apart from that, some mods (i.e., modifications or extensions) use the player's login to save the game status. The game provides a very open structured programming interface for external developers, so that hundreds of mods and "texture packs" already exist. With these, you can change the landscape, substitute objects, or alter light and shadow effects. Examples range from simple enhancements of new tools or new animals, all the way to games within the game, such as the civilization simulator Millénaire (Figure 2). Figure 2: Mods extend Minecraft with countless extras. 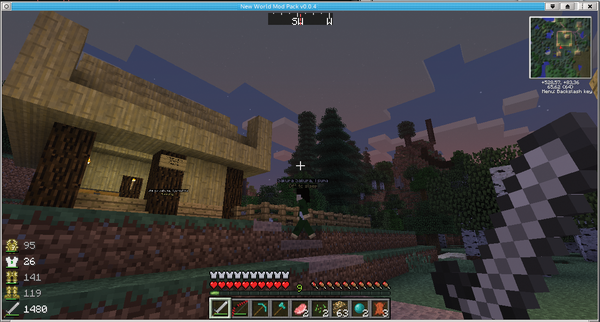 Here you can see a Japanese village from Millénaire with giant trees made with extra biomes in the background. After installing the program (see the "Installation" box), you can start the game with java -jar Minecraft.jar . By default, the launcher also loads subsequent updates. As of version 1.6, the option exists of storing installations in profiles, which don't automatically update the software. To install Minecraft, download the Minecraft.jar Java file from the website . The script opens a dialog where you enter your registered username and password. Clicking Play starts the standard version of the game or a configurable profile in which you put older or beta versions or self-assembled extended variants. At startup, the script downloads the actual software and saves it in ~/.minecraft , along with the everything else Minecraft needs. Self-built worlds and game statuses are saved in the Saves directory. If Minecraft Forge Modloader is installed, you'll find a mods directory for mods. As with some other cross-platform programs, Minecraft is Java software. The demands on memory and processor are moderate. On an IBM T60 Thinkpad with 1GB RAM, the game wasn't quite fluid. On a PC with Intel Core i2 Quad and 3GB RAM, the standard configuration ran passably, although major enhancements caused some noticeable spottiness. On a Lenovo IdeaPad with Core i3 and 8GB RAM, Minecraft ran fluidly under KDE alongside dozens of other programs. Even here, however, significant delays in rendering windows occurred during active gaming in some cases. In terms of graphics, the game requires decent hardware and an activated hardware accelerator. The website and various instructions recommend installing the Oracle runtime environments for Linux. In our test, the game run well on Kubuntu 13.04 with Open Java. Even with some of the bleeding-edge advanced packages, we did not detect any problems. The presets are not particularly conservative – all functions are turned on, including extras such as animated particles. Upon first startup, the installer also downloads the entire game (see also the "Installation" box). Once you've applied a new world in single-player mode, the game character enters a landscape that looks different every time because of a sophisticated random terrain generator. Minecraft includes landscapes such as jungles, savannahs, winter forests, and mountains made up of 10 different types of trees, some plants, and block-like objects. The blocks represent earth, sand, gravel, stone, and minerals. Minecraft even renders snow, ice, fire, water, and lava from these rectangular blocks. Water and lava are rendered as animated liquids. Rain and snowfall provide for varied weather. There is no wind, however, and only a few simple sounds and a very muted soundtrack. The sound works perfectly, by the way, with Alsa as well as PulseAudio. The software module that assembles the landscape is among the more remarkable technical achievements of Minecraft inventor Markus Persson. As the proportions of the game character suggest, the edge of a block is in reality roughly a meter in size. With the character moving through the landscape, the module builds new elements without hitting any noticeable limit. A single world consists of a square with an edge length of a maximum 14 million blocks – the equivalent of five times larger than the earth. The game places some animals in the landscape that you can hunt for raw material and food. Apart from pigs, chickens, and cows, horses have also grazed on the steppes since version 1.6, and they can be tamed and ridden. Less often, the game builds villages with virtual inhabitants with whom you can trade some goods. The time of day changes every eight minutes. During those intervals, it's often advisable to seek refuge, because at night the game sends out a variety of monsters to hunt you down. Even harsher is the underworld, known as Nether (Figure 3). You enter the Hell, elegantly rendered in dark reds, through a portal that you have to build yourself. For this and many other things, you need raw materials that you mainly procure through virtual mining – hence the name of the game. Figure 3: Lava exists in the upper and lower worlds, both in rectangular pools and flowing. Nothing is prescribed in the game. You can choose to live in a vegan pacifist mode, living entirely from plants and hiding at night to avoid fighting monsters. Because the game invites exploration, but avoids bloody violence, it might be something parents of young children would appreciate – in Sweden, for example, the game is even used officially in classrooms. Without mods, the available weapons are limited to swords and a bow and arrows. Creative mode is peaceful from the outset, with no concern for health and the option to fly through the countryside. It also is the easiest way to learn about the elements of the game, because there are no distractions of having to dig up or build blocks and devices; you can just simply extract them from an inventory list. Commercial game companies big and small, as well as various distributors, are starting to recognize Ubuntu as a viable gaming platform. Thanks to Steam, Desura, and IndieCity, Ubuntu users will soon be able to purchase their games right from the desktop.